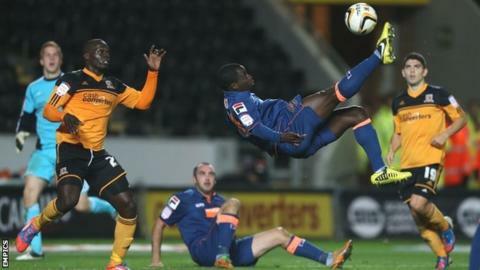 Nouha Dicko fired Blackpool to victory at the KC Stadium with a fabulous overhead kick seven minutes from time. Hull had looked on course after Sone Aluko and Stephen Quinn helped Steve Bruce's side recover from Matt Phillips' early goal for Blackpool. But two inspired changes by Blackpool manager Ian Holloway changed the game. Substitute Kevin Phillips levelled after 70 minutes before Dicko produced a piece of magic to claim the points. The result lifts Blackpool back into fourth place, two points from the automatic promotion places on a night when Gary Taylor-Fletcher returned from a back injury, one of six changes from the team beaten by Cardiff. Blackpool had made the perfect start, scoring with their first attack of the game as an unmarked Matt Phillips fired Nathan Delfouneso's cross beyond Ben Amos from 10 yards. Jay Simpson blazed wildly over for the Tigers, before Alex Bruce produced a terrific last-ditch tackle to deny Delfouneso as he bore down on goal. The Tigers were piling on the pressure themselves, however, with shouts for a penalty waved away as Sone Aluko went to ground under a challenge from Stephen Crainey. From the resulting corner, the ball into the box appeared to strike Tiago Gomes's arm, but again the appeals fell on deaf ears. However, six minutes before the break, Hull were level. Aluko received the ball midway inside Blackpool's half and looked around for support before letting fly with a brilliant effort from 25 yards. A terrific ball from Aluko put Simpson in the clear, only for him to stumble and lose control, but Hull took the lead inside two minutes of the second half through Quinn. A great ball from Aluko found the Irishman near the byline and from an acute angle he dispatched a clinical shot into the far corner. Ahmed Elmohamady shot straight at Gilks, a Quinn effort was deflected for a corner by Osbourne and Abdoulaye Faye then headed over as Hull pressed for a third, but despite all the hosts' pressure, Blackpool equalised after 70 minutes. Crainey swung over a free-kick, Taylor-Fletcher prodded the ball across goal and Kevin Phillips bundled it home from a yard out. Holloway introduced Dicko after 75 minutes and eight minutes later he fired the visitors ahead with a brilliant overhead kick. Kevin Phillips chased a long ball over the top and as Amos went to close him down on the byline, the veteran striker chipped over a cross which was headed clear only as far as Dicko, who flung himself into the air to score a stunning winner. Hull City manager Steve Bruce: "It has been a horrible week. We have got to stop these ridiculous mistakes we're making. "The second goal we have not picked up from a free-kick, and the third goal, there were so many individual errors and unfortunately it has cost us the game, which I didn't think we deserved. "It was very, very disappointing. We played really well, but shot ourselves in the foot by making so many silly mistakes." Blackpool manager Ian Holloway: "That was a fantastic advert for how good the Championship is and how good it is going to be. "There were two really good teams out there. I would have taken a point once it got back to 2-2, but an overhead kick has managed to get us the win. "It could have gone either way, but obviously I am delighted it has gone ours."